Today however, goaded into action by his fellow competitors, we saw the lesser spotted Beardshaw down on his knees next to his venerable and it must be said, generally reliable Sunbeam Tiger. 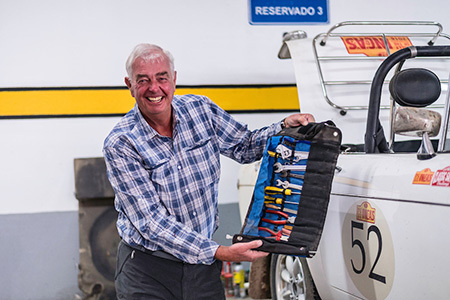 Gingerly, Alan opened up his shiny new tool-roll and began his spanner work. First he checked his nuts - a good start - and thankfully all were present, correct and just where he’d left them. Next he jacked the car up and continued with his inspection while David Roberts and Keith Ashworth, themselves more than familiar with freshly unleashed ‘rest day beasts’ kept a lookout for him. Richard Everingham was under his 1953 - Bentley R Type. Yesterday the half shaft slipped causing two wheel studs to shear and damaged the rim to boot. Today he’s fitted new studs and is using oversized nuts to secure the wheel. Other than that it’s all fine and he’s looking forward to an afternoon off. Joost van Cauwenberge has had an intermittent issue with his trip meter but obviously there’s still nothing wrong with his throttle. 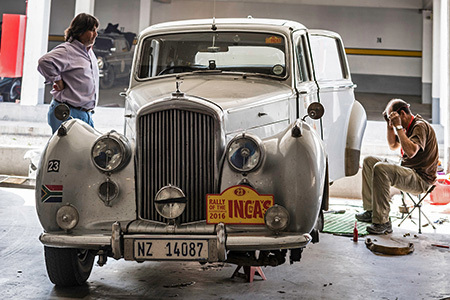 Hermann Frye-Hammelmann and Jamie Turner were busy under the bonnet of the 1963 - Mercedes Benz 300SE looking to see if they could sort a minor fuel pressure issue. Andrea Hammelmann and Paul Henschel are back with us after arriving late last night. Their 1964 - Jaguar MkII is all sorted. Ronald Vetters and Ann Puts are also back in the fold, albeit in a rental car. Their 1967 - Chevrolet Camaro gave up the ghost on day two and despite several attempts at engine rebuilds along the way and playing a heroic game of catch up they’ve decided to ship it home and just enjoy the rest of the journey. Brian and Colin Shields meanwhile drew a blank with the Buick Club of Chile who were hoping to engineer a solution to their problem. They’ve decided to ship ‘Benson’ home and continue in a hire car. Similarly Peter Thornton and David Garrett have thrown in the towel and are boxing up their 1939 - Ford Coupe to concentrate on just enjoying the journey.